Why Can't Every Game Let You Skip Long-Winded Cutscenes With Violence? 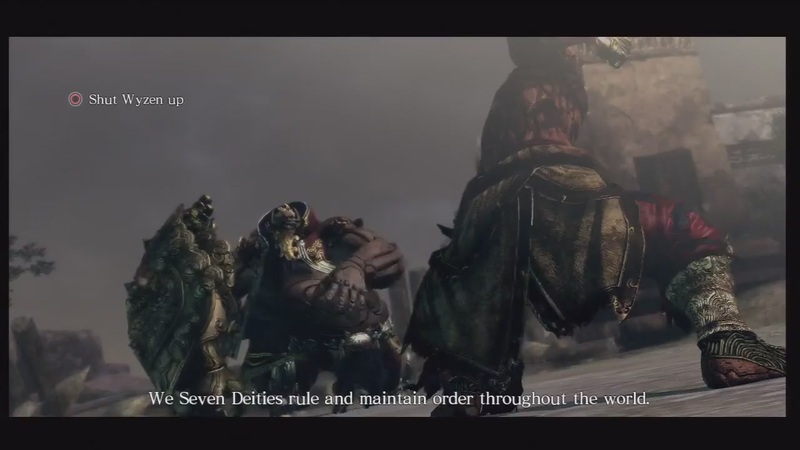 Asura's Wrath is a game brimming with excellent ideas, most of them involving punching, and while complaints that it's more cutscene than gameplay are valid, it also features what could be the greatest scene-skipping mechanic in gaming history. Video games (and popular fiction in general) are filled with villains all-too-eager to have a little chat before doing away with our heroic alter-egos. They want to wax poetic, wax diabolical, wax maniacal, while all we want is to get to the point where we hit them three times and they die. With the single press of a button, Asura's Wrath skips past the fluff and makes with the fighting. This is a feature every single game needs to employ. Yes, even Tetris. I realise it has no cutscenes. I want to punch it anyway. Hell, let us punch our games using Kinect, or the PlayStation Move. Let us use our Wii U controller's screen as a punching bag. I'd appreciate the hell out of it, and publishers can add another blurb to the front of the game box. I will not be satisfied until cutscene punching becomes so prevalent that game reviews have entire sections dedicated to how well the feature is implemented. "The graphics are fine, but the cutscene punching just didn't have the same impact as the original game. I would have expected more from a Pokémon game." One day my glorious vision of the future shall become a reality. And then I will punch it in the neck. Lol. It's like the the anti-Hepler. ME2 had a few moments of this, were definitely some of the best renegade points I earned. Agreed. I was just thankful to skip the remainder of the cut scene mostly, but it was also nice to shoot someone while they were mid sentence, too. Being a paragon apparently means waiting politely for people to finish speaking and then shooting them. If the Asura's Wrath had PS Move functionality it would be 10 folds better and at least somehow justify the expensive price in Australian stores. Having the option to skip, period, would be a good start for a lot of games. My girlffirend can skip her period whenever she wants. So can all girls, for that matter. With the help of the contraceptive pill, that is. Gender - we're doing it wrong. Wait.. what was i saying?? Oh that's right. Games need a contraceptive pill!! wait... that's not right at all..
Ha ha ha ha. Gold. RESULT OF A BROKEN CONDOM, RIGHT HERE!!! Seems i punched through, as well. Actually no, humanity haven't beaten the cut scene yet, still need at least one cut scene a year. Ha, I just knew someone was going to make a joke like this as soon as I wrote that sentence. Don't know if cutscene interaction is actually ''skipping'' given the actual action is up there on the screen as the option??? tldr. Punched the article in the face instead. Gears of War had a nice function like this. Press Back to tell whoever is talking to shut up. You could skip the cutscenes or essentially just hang up/interrupt any of the in-game dialogue. Not quite the punch in the face, but still really handy.